Madley Property are extremely excited to present this stunning 18th floor two bedroom apartment in the highly anticipated and brand new development, Gateway Tower, E16. 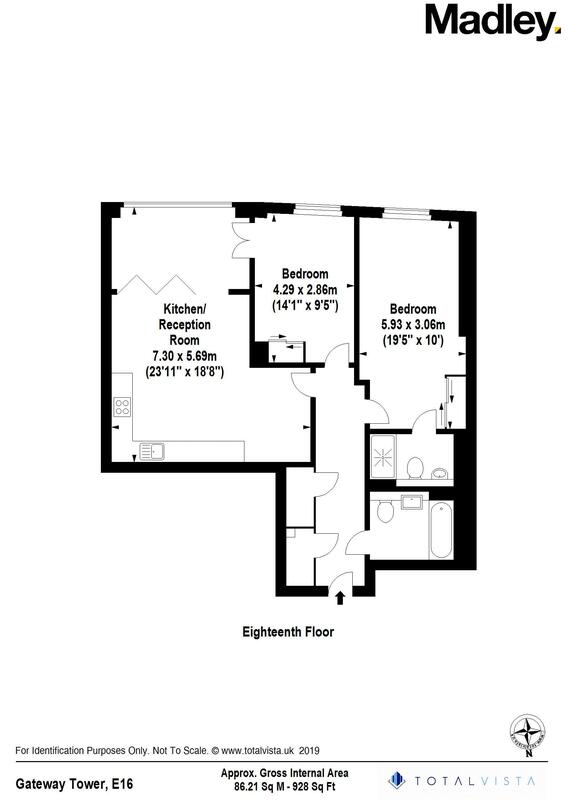 This 821 sqft apartment benefits from stunning interior design, with the open plan reception benefiting from engineered oak flooring and a fully integrated kitchen with high-end appliances. The reception leads onto a winter garden which offers fantastic views from the 18th floor. One ensuite bedroom and a double bedroom, both benefiting from fitted wardrobes and carpeted floors. Both the family bathroom and the ensuite are finished with quality sanitary-ware, chrome finishes and a heated towel rail. Gateway tower benefits from being located in the beautiful and serene setting that is Royal Victoria. Located within easy walking distance to the DLR, underground and soon to arrive cross rail station, it's hard to think of anywhere with a better scope of transport links! Royal Victoria offers a selection of restaurants and bars idyllically located on the dock.